Around 1770, a straight artificial canal (Gelderns-Nierskanaal) has been constructed between the River Niers and the River Meuse, crossing the border between Germany and the Netherlands, with the purpose of reducing flood risk in the downstream reaches of the River Niers. 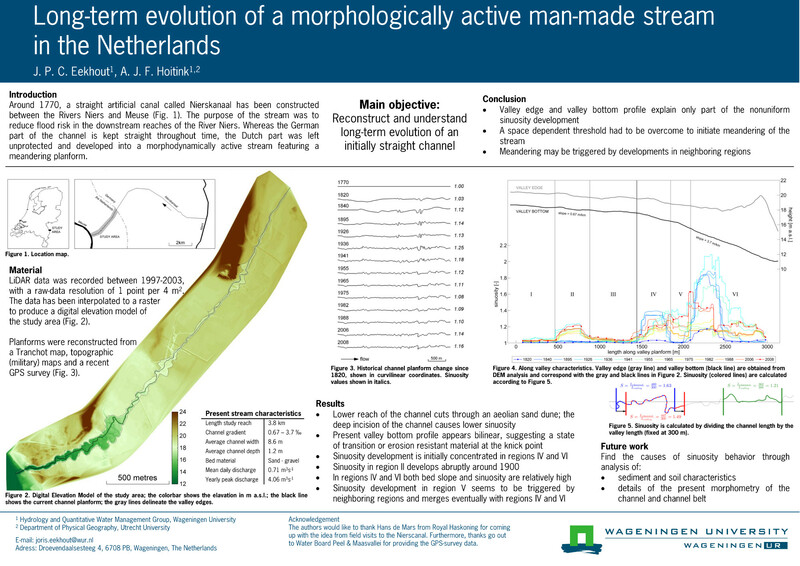 Whereas the German part of the canal is kept straight throughout time, the Dutch part was left unprotected and developed into a morphodynamically active stream featuring a meandering planform. The current planform and in-channel morphology are analyzed using airborn LiDAR data and historical topographic maps. Around the turn of the 18th century, the first attempts were made to make detailed topographic maps. From this time on, at least 16 topographic maps of the area around the stream were made. With the use of these historical topographic maps, a reconstruction is made of the planimetric shape of the stream over a period of 240 years. The LiDAR data show old meander belts at several places around the stream. Those belts compare well with the topographic maps. The sinuosity increases from upstream to downstream. This could be a consequence of the valley slope, where the upper part is flat and the slope increases in downstream direction. Besides, the LiDAR data show that erosion resulted in an incised valley, with dimensions to 50 m in width and 6 m in depth. Both the datasets are combined to make an estimate of the historical sediment budget of the stream.